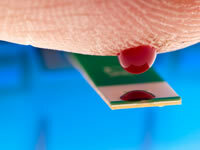 Managing diabetes has become easier as technology improves. Blood glucose meters for home testing were a major leap ahead for diabetics, and now data management systems make diabetes management more precise and easier. What is a data management system? When you test your blood glucose levels, a data management system records and can store hundreds of your test results and in some instances much more detailed data. This could include logging the date and time of your tests, the type and dosage of insulin, and the amount and type of exercise. As broadband becomes more widespread, more systems allow you to upload data to your doctor. Your healthcare team can then use this info to improve your treatment regime. What other advantages do data management systems offer? The data produced can then be transferred to a computer and plotted into graph form. Doing so allows the patient to clearly see how their blood glucose management is progressing. The patient, with the aid of a healthcare team or GP, can then see at a glance where they are going wrong with their control. What should I record using my data management system? You should decide with your doctor what needs to be recorded before buying a data management unit. Some doctors will want to see glucose values, dates and times. However, other doctors may wish to see information about exercise, diet or dosage of insulin. What potential problems are there with data management systems? Compatibility issues do arise from time to time, so always make sure that the data management system you buy is compatible with both your computer and the computer owned by your doctor. Some data management systems are easier to use than others. The cost of data management systems can also be prohibitive, so they are not for everyone.